Hi Friends: Today's post is a Happy New Years tag. It's based on the techniques from the Tim Holtz tag for December and has a New Year's theme of celebration, inspiration, and looking forward to the coming year. Please see below for process, challenges, and supplies. Have a super day and Happy New Year! I started with a plain manila tag as my base. 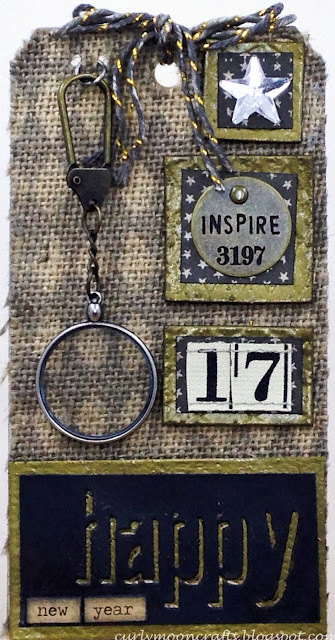 I used my Tags and Bookplates die to cut a tag shape from some burlap paper and glued it to the front of the tag. I used the Burlap and Punches technique with the Harlequin layering stencil and Hickory Smoke stain to add the pattern to the burlap, then sprayed it with a bit of Heirloom Gold for some shimmer. I cut a strip of black cardstock and used the ShadowPress technique with the Shadowpress Station, Versamark ink, and some gold embossing powder to deboss the word and create the enamel shadow. I added some Chit Chat stickers to finish the title, then layered it over some recycled cardboard that I heat embossed with the gold powder. For Tim's tiles, I used some Harlequin embossed Grungeboard shapes from my stash and heat embossed them with the same gold embossing powder. I cut some strips of star paper from my stash of Tim's Motif resist papers, colored them with some Black Soot distress ink, and layered them over my tile shapes, then added the star, metal word, tag, and the numbers cut from the Ruler Ribbon and attached them to the tag. I added the monocle with a swivel clasp - it is attached to the tag with the jump ring that I removed from the monocle. To finish, I used the Hickory Smoke stain to color some baker's twine, then attached it to the top of the tag. So much fun!